New York, NY, November 19, 2018 - The Local Climate Action Summit, held in New York City during Climate Week NYC in late September, focused on the challenges and opportunities facing local communities in the Northeastern United States because of climate change. The Cornell Institute for Climate Smart Solutions (CICSS) partnered with New York Sea Grant (NYSG), Cornell University, the Science and Resilience Institute at Jamaica Bay, and the David R. Atkinson Center for a Sustainable Future to host the summit. Organizers set forth some key concepts that drove the summit, such as a need to define what local climate leadership looks like, share the latest research about climate change action, and explore ways an Extension Volunteer Climate Stewards Program can best help local communities with climate change education, communication, mitigation and adaptation projects. The summit featured talks from non-governmental organizations and municipalities working to support local climate action, updates from researchers on community impacts and needs, and a session generating stakeholder input on an Extension Volunteer Climate Stewards Program. Kathy Bunting-Howarth, NYSG’s Interim Director, served as the moderator of a breakout session on stakeholder input solicitation to the Extension Volunteer Climate Stewards Program. Typically, Extension Master Volunteer Programs (such as Master Gardeners) recruit volunteers from a community who receive training on a particular topic and then work in their community on those designated projects. The program connects volunteers to a research-based curriculum to conduct peer-to-peer outreach. Master Volunteers work with experts from land-grant universities and serve as a bridge to their communities to increase the reach of programming on important topics, which are, in this case, climate change science, mitigation and adaptation. The stakeholders attending the Summit were asked to discuss possible means of increasing climate action, barriers to local climate action, and provide input as to how trained Extension Climate Steward Volunteers could help their community with local climate change planning and projects. The Summit was the culminating event for the U.S. Department of Agriculture's National Institute of Food and Agriculture (USDA NIFA)’s funded project to conduct a needs assessment for the Volunteer Climate Stewards Program, which was led by CICSS, University of Maryland (UMD) and the Northeast Climate Hub and in which NYSG partnered. NYSG, with partners at the CICSS, was recently awarded a Smith Lever grant to develop the program for New York. During this three-year project, Sea Grant and CICSS will design, pilot and implement the program in four different regions of New York State. 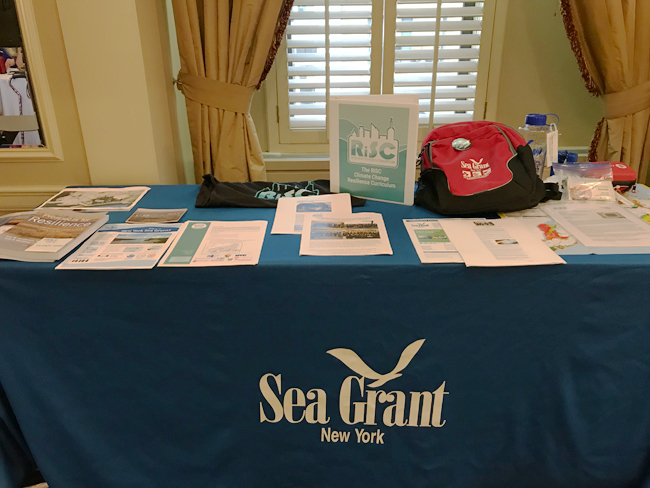 NYSG shared outreach materials with a variety of stakeholders from the mid-Atlantic during the Local Climate Action Summit. Credit: Ryan Strother/NYSG. The initiatives of the Local Climate Action Summit dovetail with NYSG’s many climate change extension projects, outreach and education efforts designed to mitigate effects and inform coastal communities along New York’s Atlantic Ocean and Great Lakes coastlines. In response to record high water levels in 2017, NYSG provided funding to Cornell University investigators to survey the impacts of inundation and erosion. Other studies covering topics ranging from improving storm surge modeling used for flood prediction, to impacts of sea level rise on coastal habitats have also been supported. NYSG also worked with partners and local governments to provide training opportunities that will improve the resilience of communities to the impacts of climate change and other community stressors. A day-long event was held in Erie County, and a resilience track is being offered at the Genesee Finger Lakes Regional Planning Council’s Local Government Workshop. There are several initiatives supported by NYSG to bring climate science to the classroom. 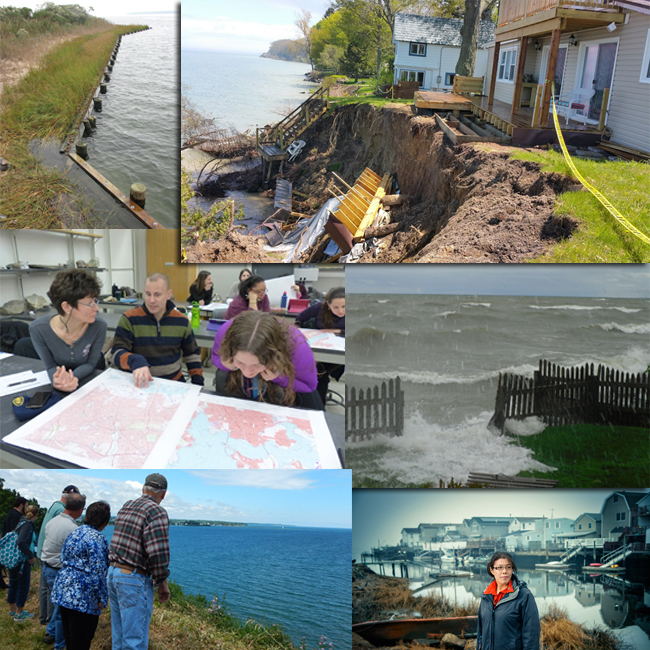 Sea Grant collaborated with the NYSDEC to create a set of nine place-based lesson plans and activities to help middle school teachers and students understand climate change close to home. NYSG participated in the three year Resilient Schools Consortium (RiSC) Project, engaging underserved middle and high school teachers and students in South Brooklyn. Studies covering topics ranging from improving storm surge modelling used for flood prediction, to impacts of sea level rise on coastal habitats have also been supported by New York Sea Grant. For more information, see NYSG’s one-pager on “Climate Change and Adaptation” (pdf). A sampling of NYSG's recent Climate Change Adaptation and Education efforts (clockwise from upper left): (1) An example of a living shoreline. Credit: Jay Tanski/NYSG; (2) Land and yard features lost to erosion in Hamlin, NY (Monroe County). Credit: 2017 Coastal Flooding Survey Project/Cornell U and NYSG; (3) Waves driven onto yard in Rochester, NY (Monroe County). Credit: 2017 Coastal Flooding Survey Project/Cornell U and NYSG; (4) Helen Cheng, NYSG’s Jamaica Bay Coastal Resilience Specialist at SRIatJB, the Science and Resilience Institute at Jamaica Bay, hosts a NYC climate forum and podcast series. Credit: Jason Koski, Cornell U Photography/Ezra Cornell University’s Magazine; (5) NYSG shoreline tour participants view a bluff protection and stabilization project along Lake Ontario. Credit: courtesy of Heather Weitzner/NYSG; (6) Some 100 elementary school teachers have taken part in the NOAA Environmental Literacy Grant-funded “Visualizing Coastal Change” workshop series held at Queens College. Credit: David Jakim.